Winter vegetables are starting to pop up. How could we be upset when that means endive, broccoli, and cauliflower? Especially when these veggies are being mixed with our summer goodies that are still going strong. I think our CSA bag is pretty darn magical around this time. 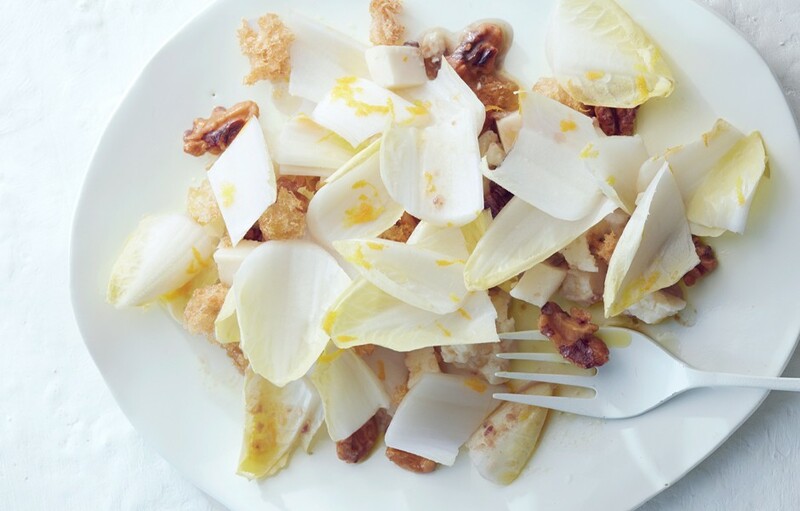 Endive is considered "white gold" by the Belgians and we understand why. Its elegant pale white leaves are the perfect crisp addition to any salad. Endive could be steamed or grilled to sweeten up its bitter flavor. Personally, its bitterness is what I crave to spike up a salad. Endive is great paired with other spicy vegetables. On the other hand, it's also perfect mixed with sweet fruit for a mellower dish. Pair this salad with a fiery curry or a tangy whole roasted fish. This peppery side dish can hold it's own against deep flavored entrees. 1. Whisk together olive oil, lemon juice and zest, salt and pepper in a bowl. 2. Place endive, arugula, green onion, and parsley in a bowl and toss with dressing. This sunning salad can also be mixed with walnuts, pomegranate seeds, raisins or torn fresh breadcrumbs.